Glam up your ethnic avatar with this tasteful pink designer saree with blue detailing, done up in faux sequin accentuation along with katdana & diamond embedment for a youthful shine! 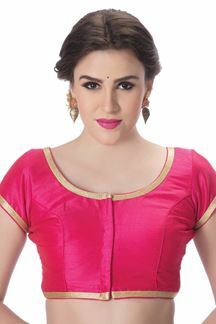 This saree comes with matching fabric unstitched blouse. The blouse in this picture is for photo purpose only. Note: Color may slightly vary due to digital photography.